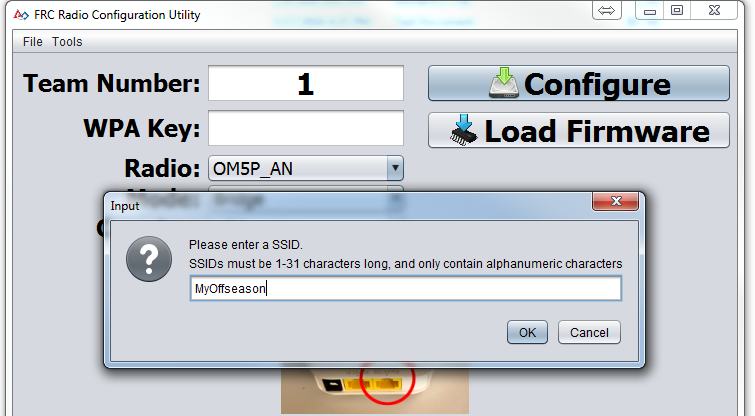 When using the FMS Offseason software, the typical networking setup is to use a single access point with a single SSID and WPA key. This means that the radios should all be programmed to connect to this network, but with different IPs for each team. 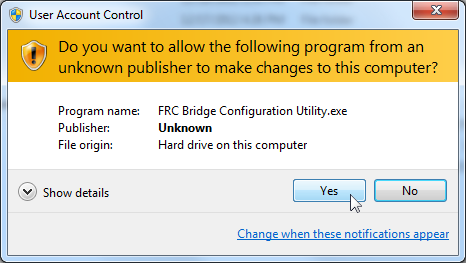 The Team version of the FRC Bridge Configuration Utility has an FMS-Lite mode that can be used to do this configuration. Make sure no devices are connected to your computer via ethernet, other than the wireless bridge. 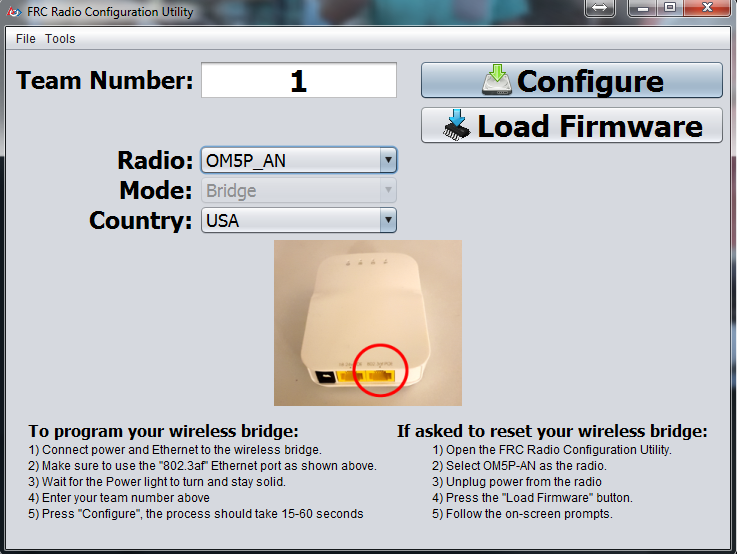 The steps below describe installing and using the FRC Bridge Configuration Utility to program radios for this network configuration. If you have a machine where you have already used this tool to program a radio for FRC 2016, skip to "Launch the Software". The FRC Radio Configuration Utility requires Administrator privileges to configure the network settings on your machine. The program should request the necessary privileges automatically (may require a password if run from a non-Administrator account), but if you are having trouble try running it from an Administrator account. The 2016 Radio Kiosk will program the radio to enforce the 7Mbps bandwidth limit on traffic exiting the radio over the wireless interface. In the home configuration (AP mode) this is a total, not a per client limit. This means that streaming video to multiple clients is not recommended. The 2016 Kiosk has been tested on Windows 7, 8 and 10. It may work on other operating systems, but has not been tested. QoS rules for internal packet prioritization (affects internal buffer and which packets to discard if bandwidth limit is reached). These rules are Robot Control and Status (UDP 1110, 1115, 1150) >> Robot TCP & Network Tables (TCP 1735, 1740) >> Bulk (All other traffic). 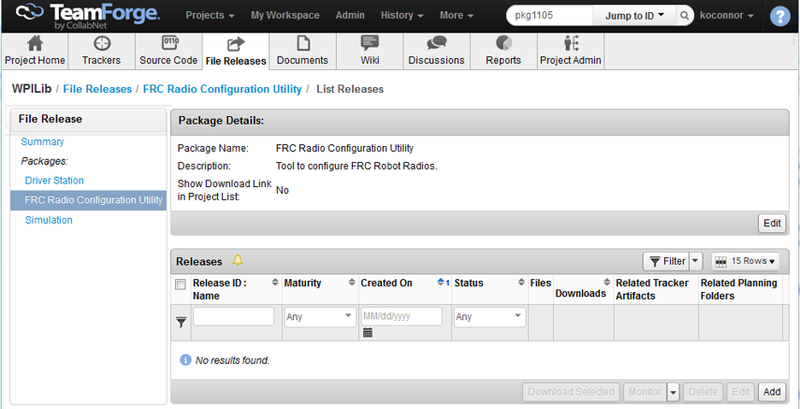 Download the latest FRC Radio Configuration Utility Installer from the WPILib project File Releases. Double click on FRC_Radio_Configuration_MM_DD_YY.exe to launch the installer. Follow the prompts to complete the installation. Part of the installation prompts will include installing WinPCap if it is not already present. The WinPCap installer contains a checkbox (checked by default) to start the WinPCap driver on boot. You should leave this box checked. Use the Start menu or desktop shortcut to launch the program. If the your computer is running Windows Vista or Windows 7, a prompt may appear about allowing the configuration utility to make changes to the computer. Click "Yes" if the prompt appears. Click Tools->FMS-Lite Mode to enter FMS-Lite Mode. Enter the SSID (name) of your wireless network in the box and click OK. 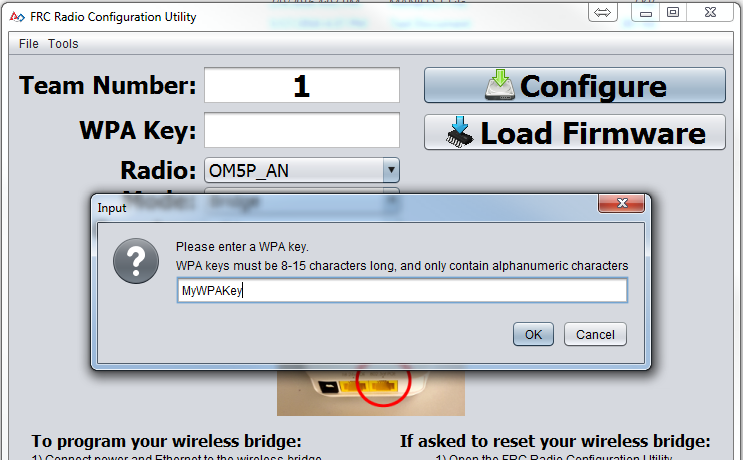 Enter the WPA key for your network in the box and click OK. Leave the box blank if you are using an unsecured network. The Kiosk is now ready to program any number of radios to connect to the network entered. To program each radio, connect the radio to the Kiosk, set the Team Number in the box, and click Configure. The kiosk will program D-Link Rev A or Rev B radios to work on an offseason FMS network by selecting the appropriate option from the "Radio" dropdown. Note: Bandwidth limitations and QoS will not be configured on the D-Link radios in this mode. If you enter something incorrectly or need to change the SSID or WPA Key, go to the Tools menu and click FMS-Lite Mode to take the kiosk out of FMS-Lite Mode. When you click again to put the Kiosk back in FMS-Lite Mode, you will be re-prompted for the SSID and Key.